Zach (Dylan Minnette) and his mother, Gale (Amy Ryan) move to a new town and, for Gale, a new job as assistant principal at the local high school. Settling into their new house, Zach takes out the garbage and meets his teenage neighbor, Hannah (Odeya Rush). He also meets her father, Stine (Jack Black) who warns him not to go any further than the fence that separates the two houses. Well……Hanna (who is home-schooled) has something to say about that, and the two become friends. One night, Zach hears a girl screaming, and fearing for Hannah’s safety he calls the police. Not finding anything, the police leave, but, Zach calls his new buddy, Champ (Ryan Lee), to help him break into the house to see if Hannah is ok. Inside the house, they discover that Hanna is fine, and also a bookcase of “Goosebumps” books that are all locked. They unlock one and the Abominable Snowman appears! OMG. Another book opens accidentally, letting out a mischievous dummy, Slappy (voiced by Black) who then opens, and destroys, all the rest of the books! Monsters are loose in the town and no one is safe! 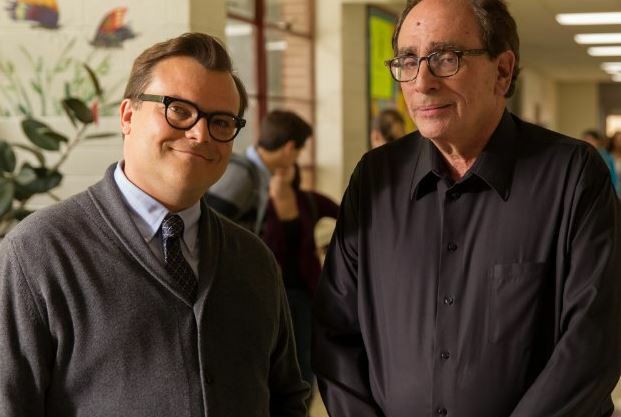 “Goosebumps” is a really fun movie. Scary monsters, lots of action, and a surprise as Hannah is not what she seems to be. R.L. Stine makes a cameo (see picture with Black). Good for the whole family.